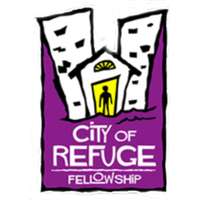 At City of Refuge Fellowship we are confident that our first calling is to prayer. God has made it abundantly clear that we can accomplish nothing without prayer but that if we will devote ourselves to seek His face then nothing will be impossible. We believe that through the power of intercessory prayer that God will bring great reconciliation. We are asking God to first reconcile men to Himself through salvation and then to reconcile us to one another in unity. God has given us a vision to begin a 24 hour a day prayer and worship center in Burlington City. We desire to see the Body of Christ united by and in prayer. We desire to be the tool that God uses to establish this House of Prayer and pray that it would become a function and a gift for the entire community. We long to see this become a place where prayers never cease and where the fire on the altar never goes out; not just for one church or one group of people but for all the believers of Burlington and abroad. The fullness of a 24 hour a day House of Prayer continues to be a vision for the future, but God has given us the grace to begin taking steps to see this come to pass. We are currently meeting on 4th Sunday of each month for worship based prayer and intercession.